LAS VEGAS - Iimagine speeding away from a traffic stop, leading police on a high-speed chase and getting away with it. In the real world, it's not legal. But at Las Vegas Motor Speedway, now, it is! It's a new attraction offering an unusual thrill. Screeching tires, high speeds and blaring police sirens. The new experience coming to Las Vegas in mid-January for sure a thrill for a bucket list. The experience begins inside a former prisoner bus that picks you up at the Strip and brings you over to the Las Vegas Motor Speedway. Once you're here, you're in for what Damian Sheets, co-founder of "Police Chase Las Vegas," describes as an adrenaline rush of a lifetime -- a simulated hot police pursuit. "You get to go out and do something that you wouldn't normally be able to do," Sheets said. "You get to live the fantasy of being a police officer for a day or you get to be the crook for a day." These are your options. You can be the driver or a passenger inside a police cruiser or inside the suspect's getaway car. And as you jump inside, that adrenaline rush begins. 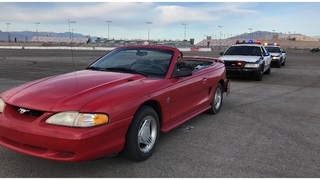 To make it even more real, the driving instructors are retired Metro and North Las Vegas Police officers, who guide you through a brief training course. "You’ll be able to do and learn pit maneuvers, you’ll be able to be pitted to see kind of what that feels like how those controlled collisions work in a police environment," Sheets said. That police environment was part of Michael Wills' life for 26 years during his time with the Metro Police Department. He retired five years ago and is now one of the eight instructors on the controlled track. "It just brings back all the memories climbing back into a Crown Vic, you know? Wills said. "Promoting respect for law enforcement. What they have to go through. Training they have to go through," Sheets said. There are eight suspect cars and more than 25 police cars to choose from. Packages start at a little more than $100 and go up from there, depending on the experience. "It’s one of a kind. I’ve seen it nowhere else in the country," Sheets said.